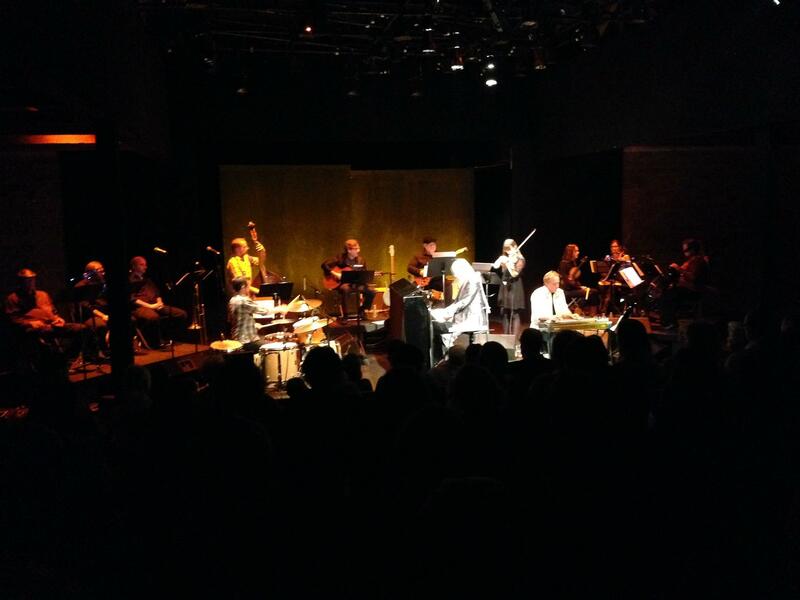 (Community Matters) Last night Graham Reynolds & 13 fellow musicians performed the first of The Marfa Tryiptych: 3 Portraits of West Texas to a sold out, enthusiastic audience at the Crowley Theatre. A rock star assembly of Austin musicians – in addition to Graham, Redd Volkaert (electric guitar), Ruby Jane (fiddle), Ricky Davis (pedal steel guitar), Adam Sultan (acoustic guitar), Alexis Buffum (violin), Elizabeth Warren (violin), Lead Nelson (viola), Hector Moreno (cello), John Mills (saxophone & clarinet), Shane Pitsch (trumpet), Wayne Myers (trombone), Utah Hamrick (bass) & Jeremy Bruch (drums). Love that Ballroom met Graham when Virginia Lebermann came to see Metropolis as a guest of Suzanne Deal Booth, who was my guest. Graham has studied, listened to West Texas as he’s composing the tryiptych. He acoustically captures a sunset from the west edge of town, the rain in the Chihuahuan Desert, even the smells after the rain. Along with Graham, Redd, Ricky, John & Jeremy soar during the performance; we want to hear even more of Ruby. Would be interesting to hear her improvisation of the high desert town. An outstanding evening and promising beginning to Ballroom’s commission.